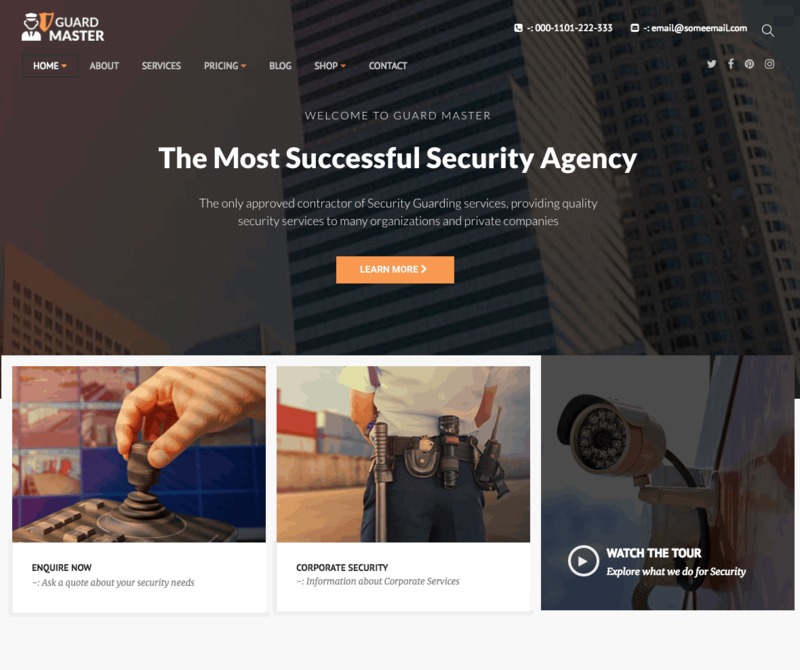 Impress your customers with the full range of your security services through an efficient website built with the Guard master Security WordPress theme. Carefully designed to convey the right look and feel for security and protection agencies, this theme comes with several advanced features to ensure your website impresses potential and existing customers. Customization options include choice between the one page version and alternate header styles. You can also change the background and theme colors to suit your preferences. Include relevant details like service options, client feedback and testimonials, contact details, link to blog page and customer forms by the drag and drop option in the Visual Composer. Apart from easy navigation, the template is also powered by Bootstrap technology which allows the website to be displayed efficiently on various screens. The demo option of Guard Master allows you to explore the various features for yourself, prior to purchase. We guarantee efficient customer support and also provide extensive documentation of the product to assist you with the theme installation and use. So install the Guard Master WordPress Theme and experience the difference a professional website can bring to your business today.